Did you know that yogurt is an excellent source of protein, calcium and potassium? 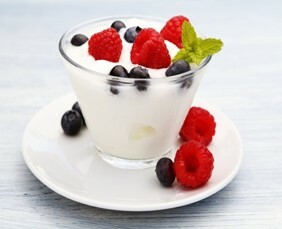 Yogurt also has beneficial probiotics, live bacteria, that help keep our digestive system healthy! Although yogurt is typically considered a healthy food, many varieties contain a lot of added sugar. A good rule of thumb is to choose yogurt with under 23 grams of sugar per 6 ounces. Or choose plain yogurts and sweeten with maple syrup or honey and then add fresh fruit, granola, or whole grain cereal for a tasty snack!